Gem's Up North : Ms Flow Subscription Box - On time, For your time, Everytime. Ms Flow Subscription Box - On time, For your time, Everytime. 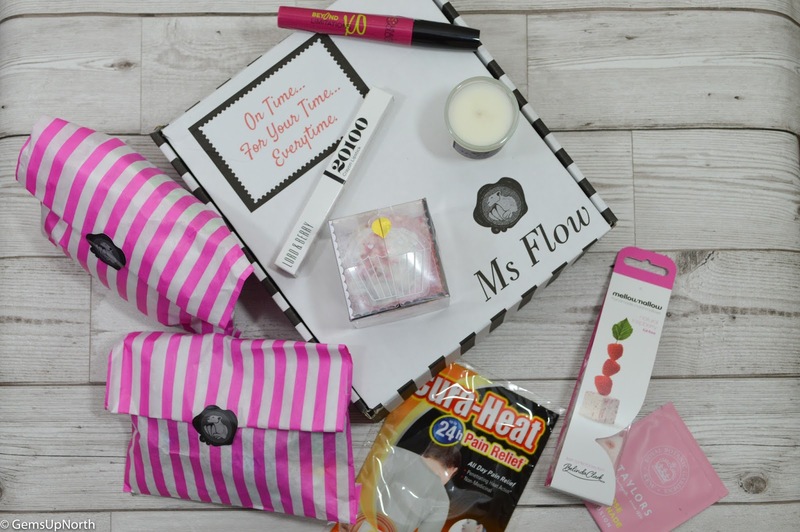 Ms Flow is a monthly well-being and period subscription box that provides us ladies with essential items as well as beauty treats, foodie items and even home ware. They aim to provide treats for the 3 things affected most whilst on your period; mind, body and soul. It's a monthly box of treats that helps us get through that time of the month and help us feel the best we can. Ms Flow contacted me via Instagram and kindly sent me a *sample box to review. The box arrived quite quickly and well packaged after being delivered with Royal Mail; the box comes in a mailing bag so its discreet too but doesn't fit through the letter box so someone would need to be in or you'd have to collect from your safe place/postal office. The box itself was quite big and the biggest sub-box I've received so I was eager to open it up to see what was inside. The box has the brands name on it with the slogan "On Time, For your time, Everytime" inside the items are packed in pink tissue paper sealed with a branded sticker; it's really cute packaging in my opinion. When you sign up to Ms Flow you can select a package that suits you and your period, prices start from £12.99 and range upwards to £14.99 and postage is £2.95; you can find out more on the Ms Flow website here. As well as the monthly sanitary items (you can select weather you want tampons, towels or a mix upon signing up) there was 7 other items filling the box. Including 2 makeup treats which are the items I get most excited about in any sub-box. 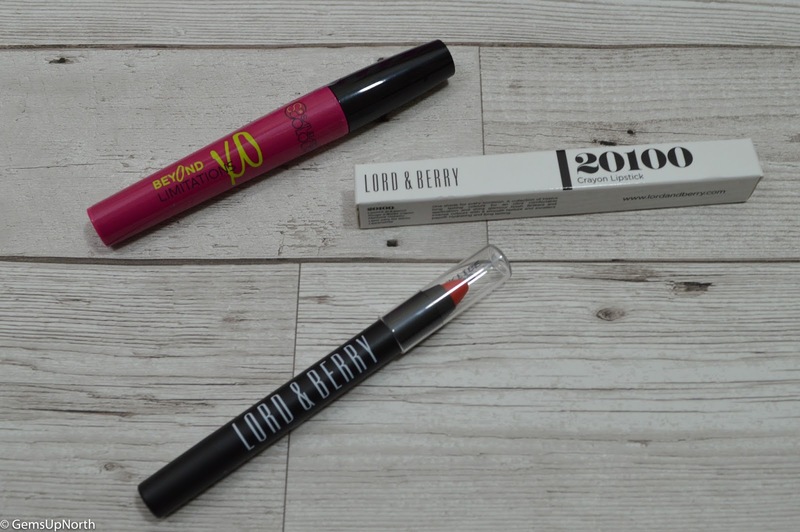 Lord & Berry is already a makeup brand that I use regularly, I have tried the lipstick crayons before but only in the shiny range. This lipstick crayon is from the matte range but is the same shape and easy to use crayon, the shade I received is Vertige which is a go to red shade. Each of L&B's lipsticks I've tried apply smoothly and with a lip liner last a few hours before any fading. To receive an item that's nearly the same price as the box is really good value for money. I have followed Saturated Colour on socials for some time but haven't had the chance to try any of their products yet so I was happy to find the Beyond Limitations Mascara in the box. I wear mascara everyday and I'm always happy to try new brands and new styles of mascara. This mascara has a great wand for applying the product, the shape is long in length, thicker in the middle and has a curve to it so my lashes curled when I applied it. I prefer a rubber wand towards a brush style one as I feel I don't need to apply as much mascara with a rubber wand and I achieve a fuller and curled look. Again this is a quality item featured and makes the box great value for money. Ms Flow sell their own candles on their website and in an range of scents, the candle I received is the 'Lime Basil & Mandarin' which has a fresh and fruity scent. Lighting a candle can calm my mood and enhance the room atmosphere meaning my bad mood can lift in no time. I like to sit and chill with a candle burning, this little candle scented my bedroom quickly and gave the room a fruity smell. Suffering with sciatica pain means I use heat patches all the time so this was a very welcomed product. It's a great addition to the box though for that time of the month when back pains can occur. 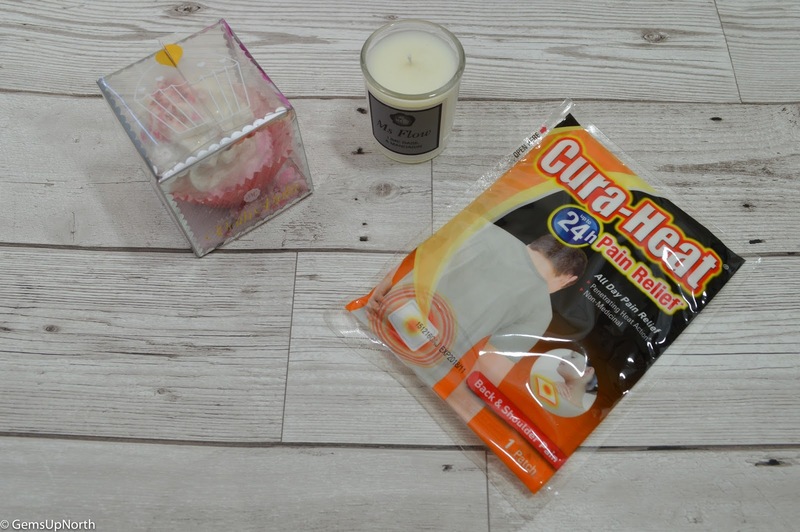 I'd say Cura-Heat is good brand of heat patches to buy but they do have to be applied to your clothing and there are some patches out there that can be placed on your skin; I find these type of patches work quicker. This is my second item from Miss Patisserie after finding a bath bomb in another subscription box last month. I rarely have a bath as I prefer showers but when my back is bad or I need to relax I will run myself a bath and drop a bath bomb in. This 'Sugar Heart' bath bake is in the shape of a cupcake and after removing the paper can be placed into a warm bath to frizz away leaving a sweet scent that can cheer anyone up. I think this was my favourite item in the box because they was so so so tasty!! I've never had marshmallows like these before and the natural ingredients made them even better. Mellow-Mallow hand make marshmallows that are fat free and have natural flavours. 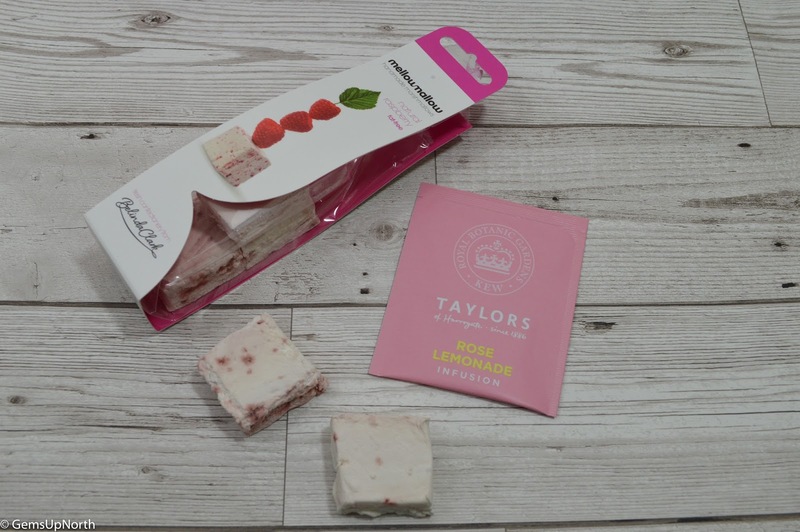 This packet was the raspberry flavour and was fantastic, the raspberry taste is very prominent in the marshmallows and really flavour the soft mallows. I'll be honest these didn't last very long at all! I understand that a lot of people drink tea and use it as a comfort drink so adding a tea-bag into the Ms Flow box is a super idea. I personally don't drink tea or coffee so this tea-bag was put in my cupboard for when I have guests around. The flavour 'rose lemonade' sounds delicious though. Ms Flow has a great range of treats to help us get through our periods and provides us the necessary items we need without going out to the shops. As for value for money, you can see that the treat items are worth more than the box price no matter which subscription you choose so your getting all your monthly bits for free really. For anyone who likes a monthly treat in the form of a sub-box and wants their period items delivered them Ms Flow is a good box choice for you! *PR Sample - all comments/opinions are my own, see my disclaimer for more information.